Can't wait to find out if you've won? Purchase one here! Very cute - love the photos of the cats with theirs. 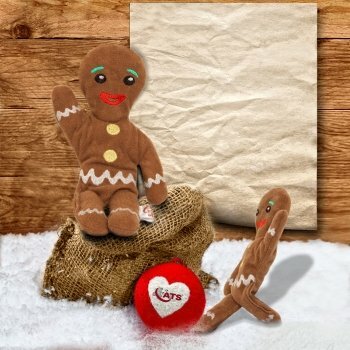 Already have a gingerbread man for Spikes Christmas if I won I would pass them on to The Cats Protection as they have a large Christmas sack for people to donate food treats and toys for the cats that have not found their forever home. My kitties LOVE valerian toys. My Bluebell would love one of these toys. They look sooooo cute! We would really enjoy these toys! Purrfect!! My 4 cats would love this! Coming from 4 Cats (or maybe that's the title) it seems fitting. We would love to win some Valerian toys to share. They look fun and like Nubia, we flick our tails and roll on our favourite toys too. Unfortunately our home was flooded and our human owner lost everything contents wise. We are currently in temporary accommodation until 5 January whilst our home is being fixed via Buildings Insurance. Unfortunately we didn't have Contents Insurance, so there's a lesson learned! Consequently we have no toys at the moment. Santa knows we have been good.